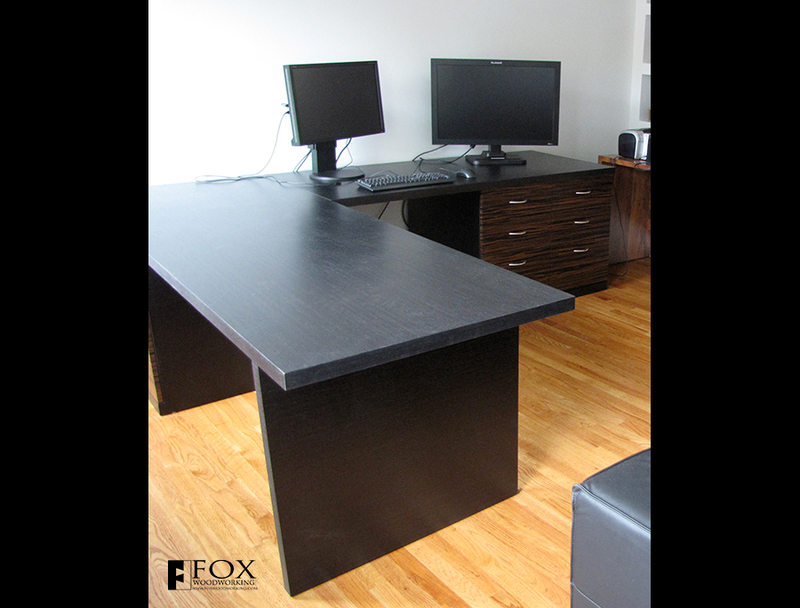 This large macassar ebony desk provides two work spaces. The primary work space is used for working on the computer screens (a ventilated compartment to house the CPU is in a cabinet below the desk top). The other work space faces the windows providing a nice view. Having access to both sides of the one work space allows the client to help her children with their homework. The two different veneers are actually man-made products from Brookside Veneers that are nearly indistinguishable from the real veneer. The dark desk tops are an ebony veneer and the doors and drawer fronts are macassar ebony. The bottom two drawers on the visible drawer unit are both file drawers. 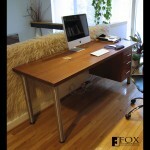 I really like this desk and am looking to furnish my office. Where can I find this product or is it custom? Thanks for the comment. All of our work is custom so if you have something in mind just send us some details or give us a call and we’ll be glad to work with you to build a fantastic desk. PS I see that the comment displays weirdly, I’ll try to fix that.